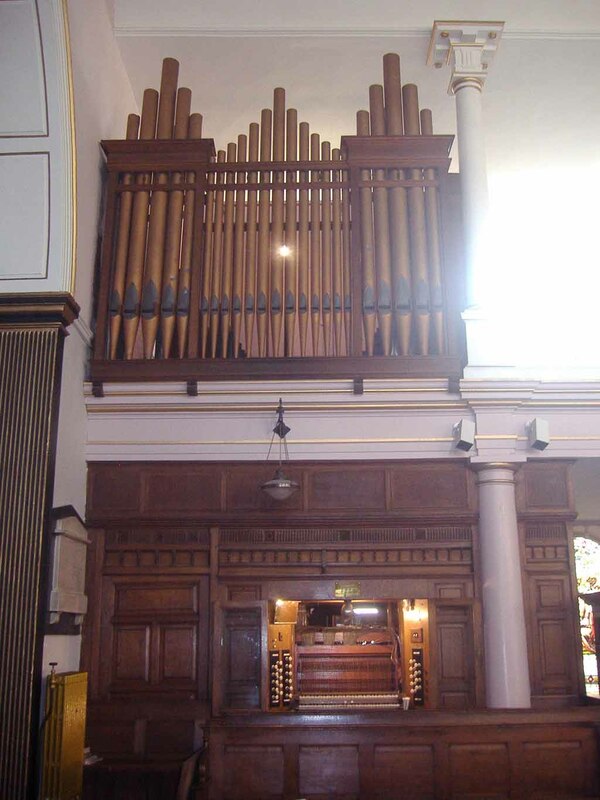 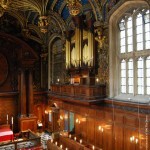 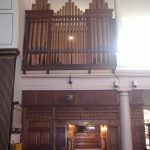 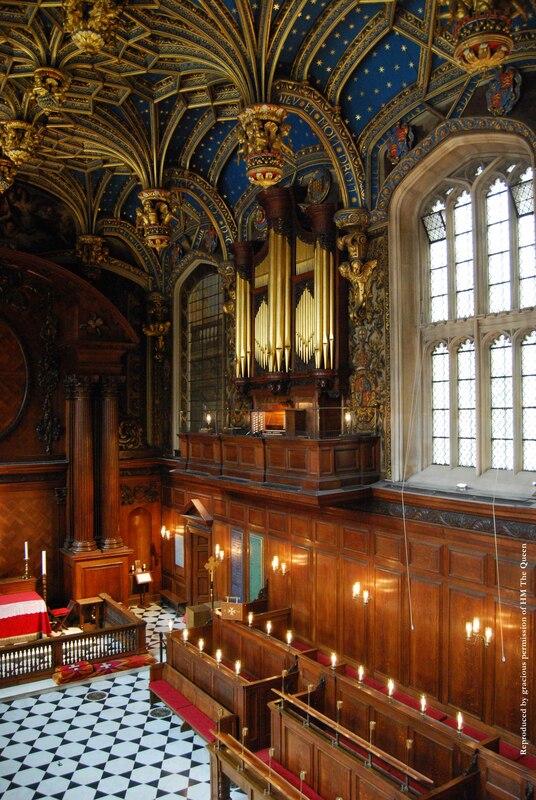 Case by Gibbons and some pipework by Shrider 1712; organ by Hill 1857/99, substantially altered since. 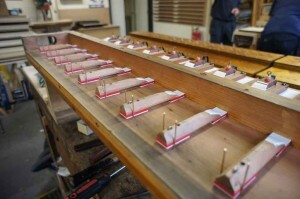 Overhaul with alterations to 33 stops. 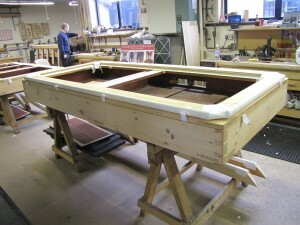 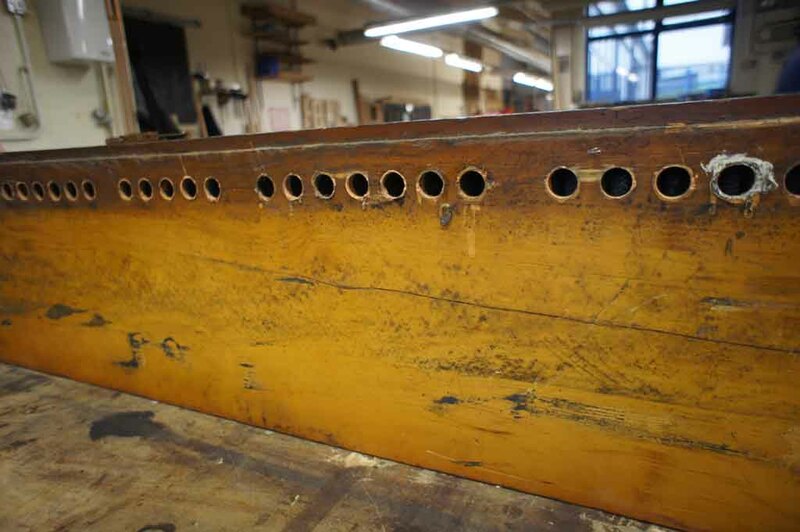 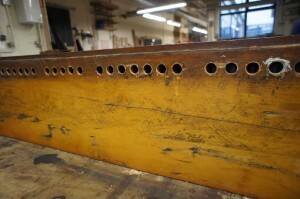 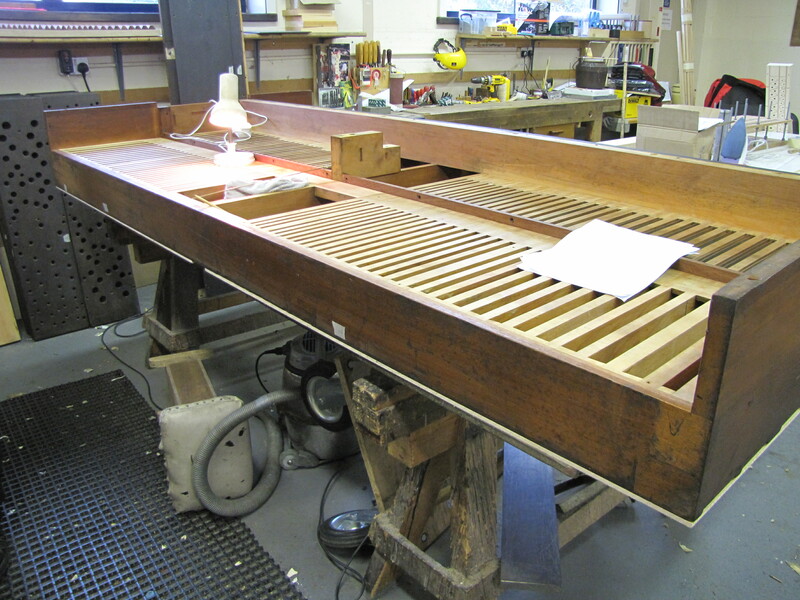 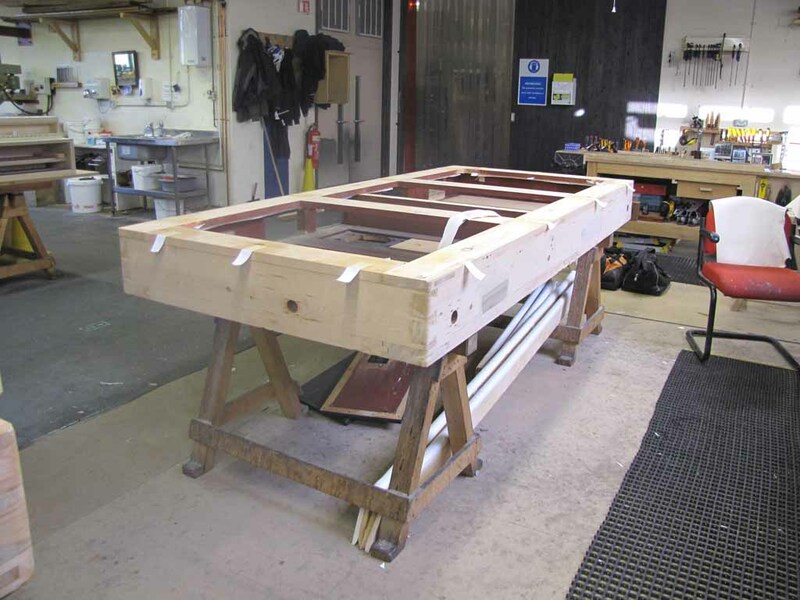 Shows the Great Bourdon 16ft before being overhauled. 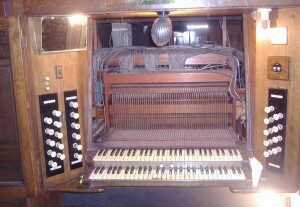 This is a fine organ built by Willis in 1877, with minor alterations including the enclosure of the Choir Organ. 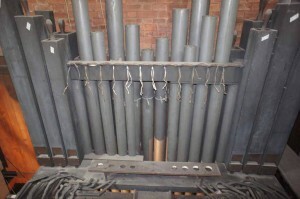 The organ has been fully restored, and the water engines have been brought back into service. The Choir enclosure was removed but the other alterations have been retained. 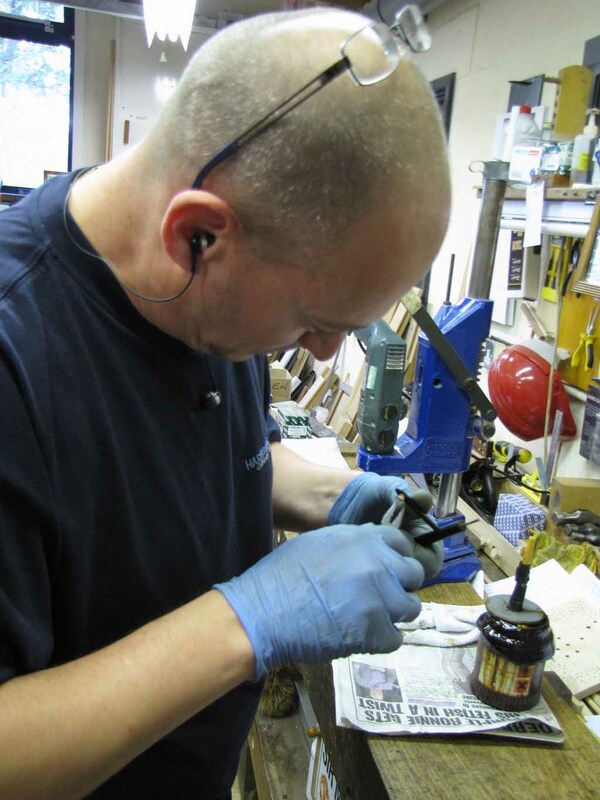 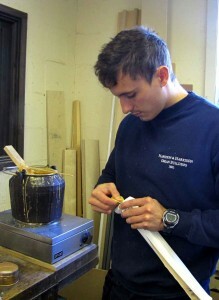 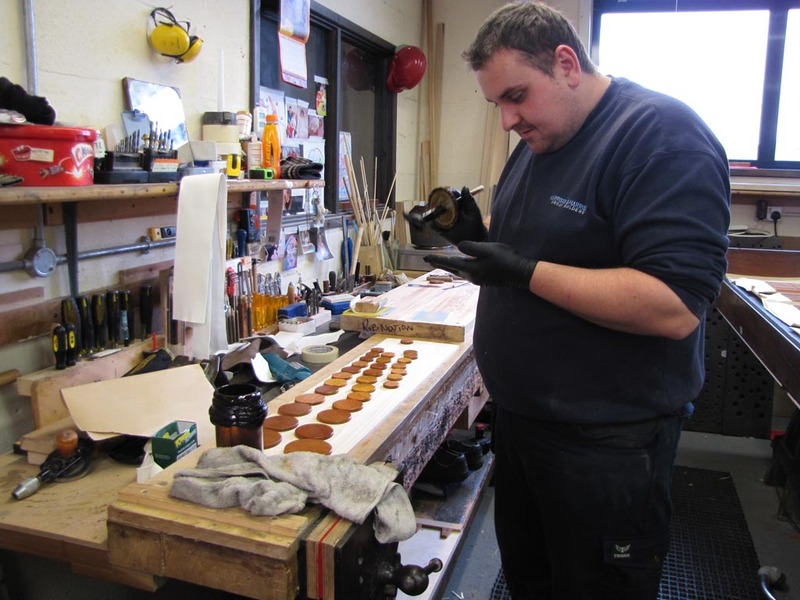 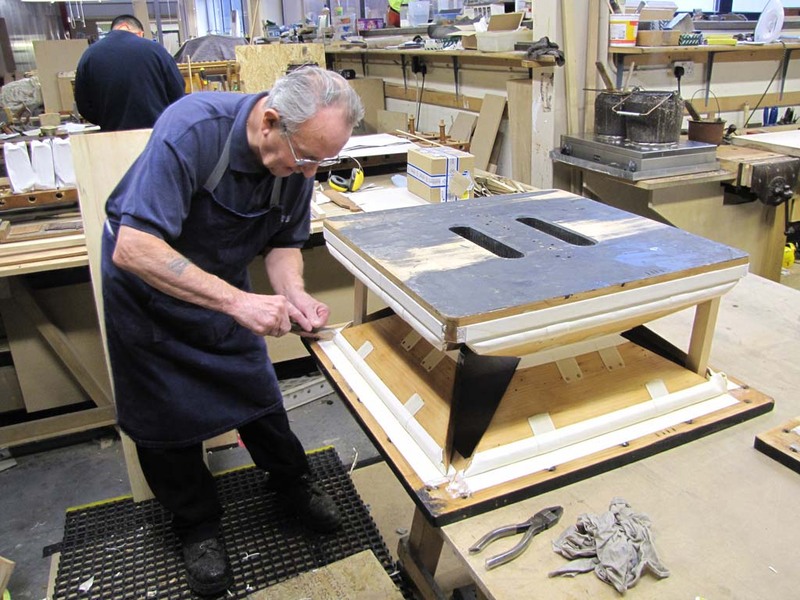 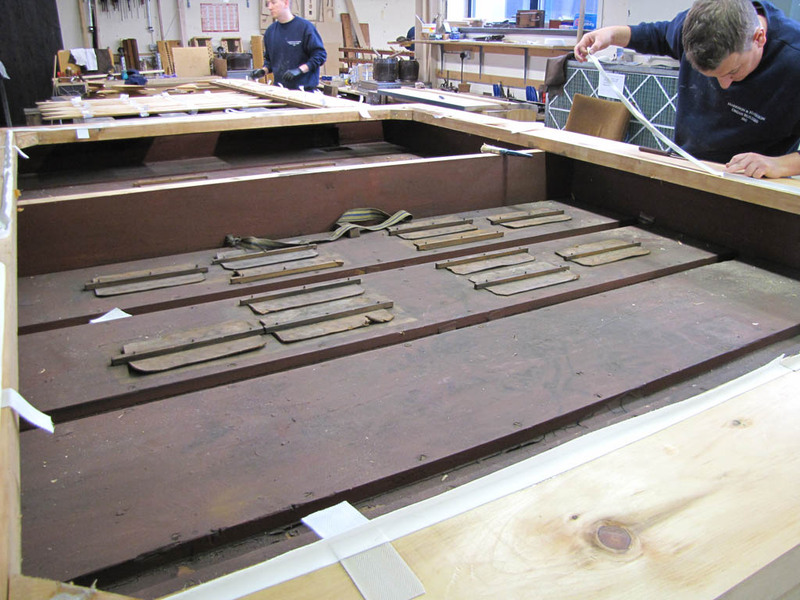 All work has been done to strict restoration standards and we are producing photographic and written records. 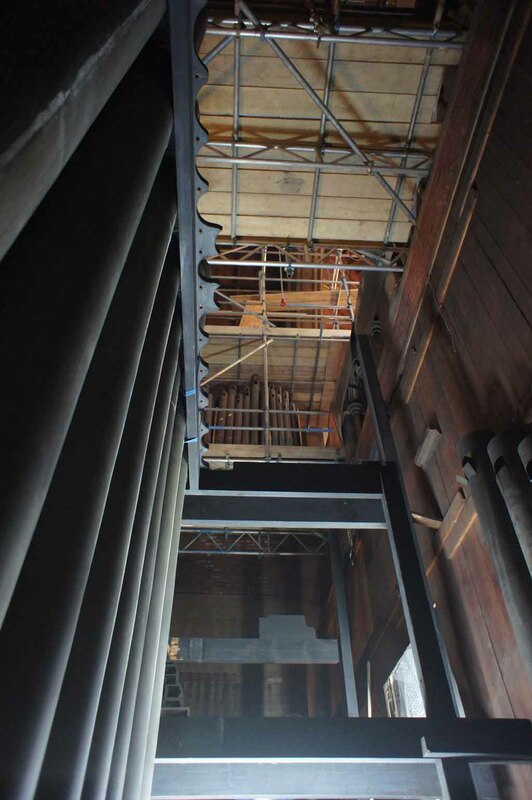 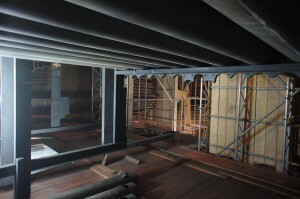 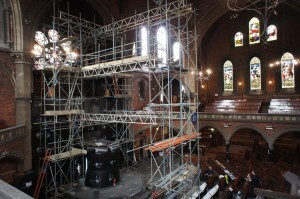 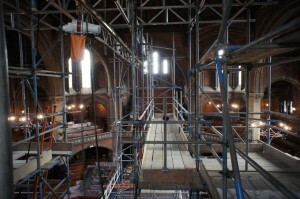 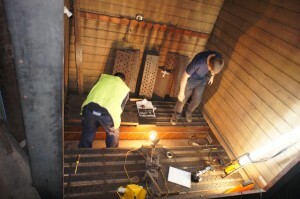 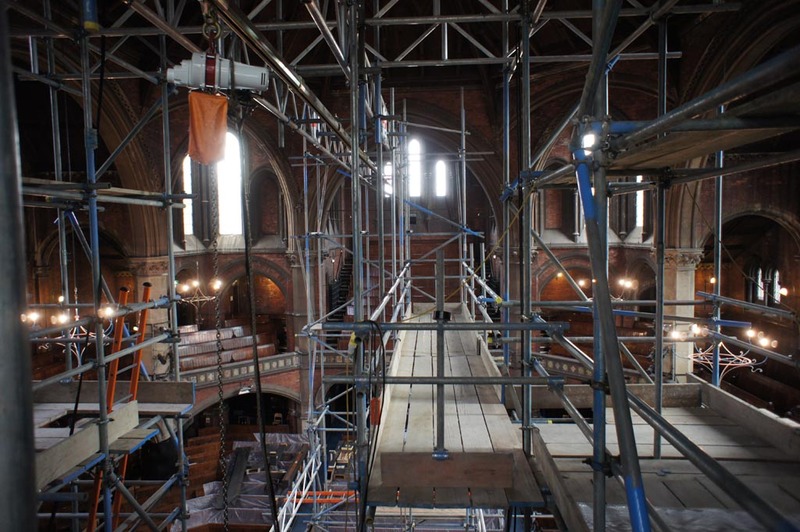 Dismantling of the organ started on the 19th July 2012. 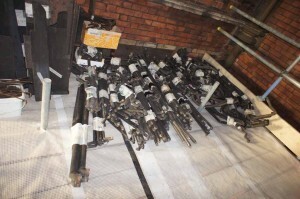 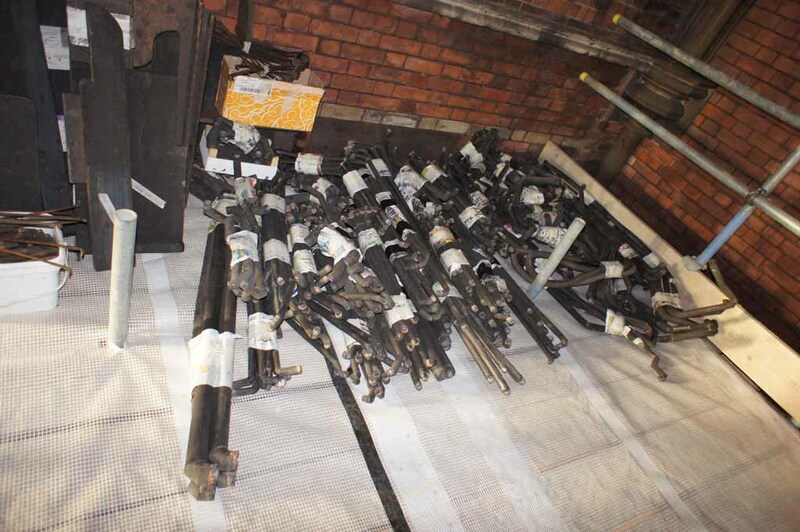 Pipework which needs repairing or renewing is taken out. 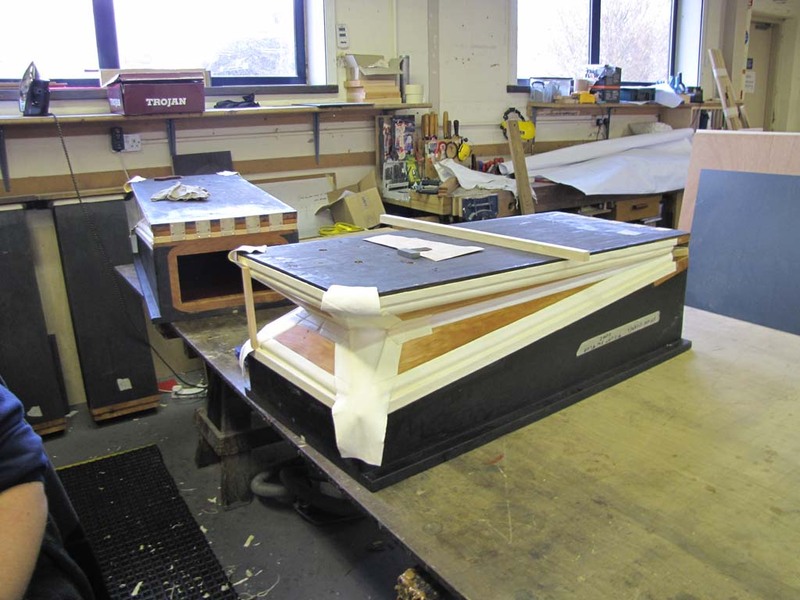 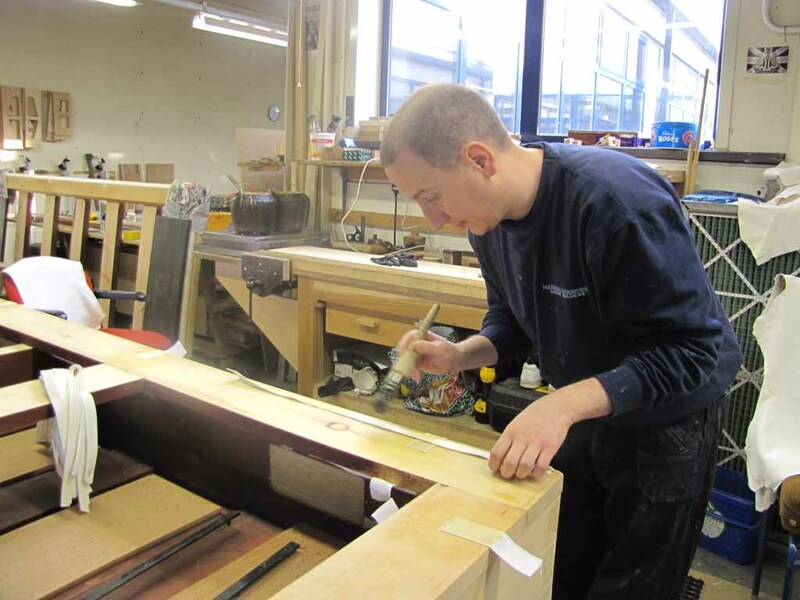 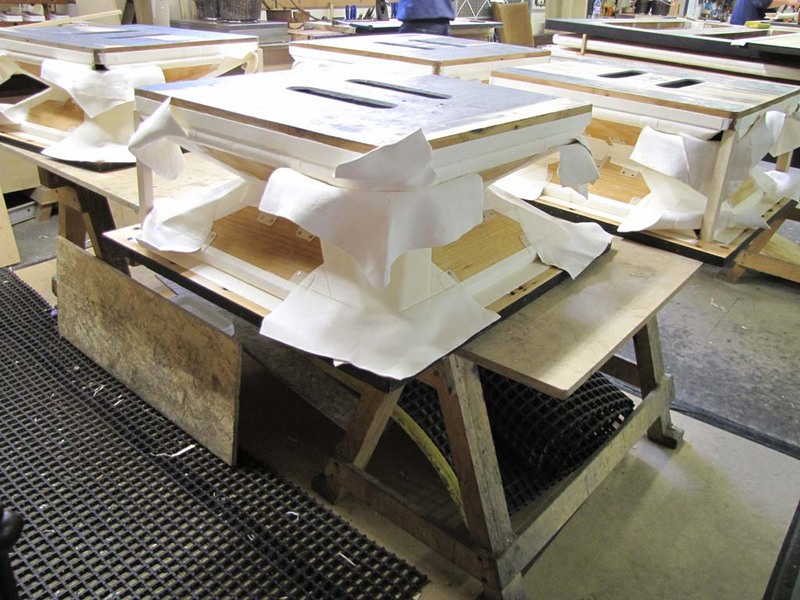 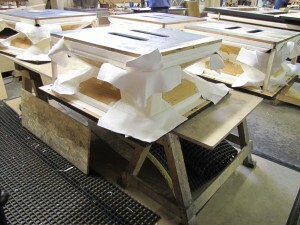 Console is dismantled Vulnerable items are packaged carefully to prevent damage. 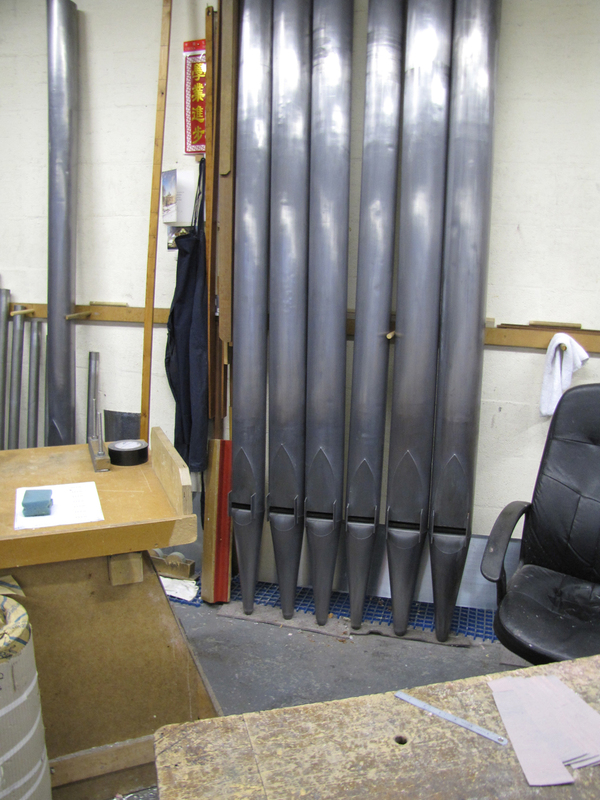 Pipes left need to be cleaned. 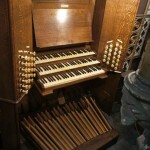 The console is a cabinet containing the manuals, pedal keyboards and the stop control. 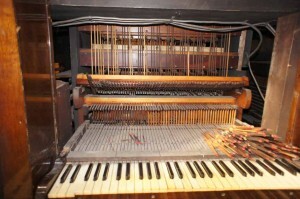 The parts of the organs action are found in the cabinet. 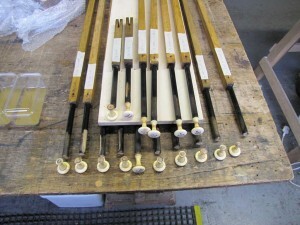 This whole set of stickers was replaced by new ones of the same design. Just one example of the many years of wear and tear taking its toll. 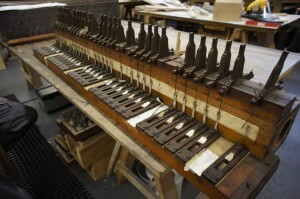 Pedal touch box before restoration. 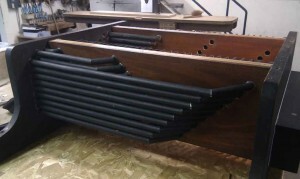 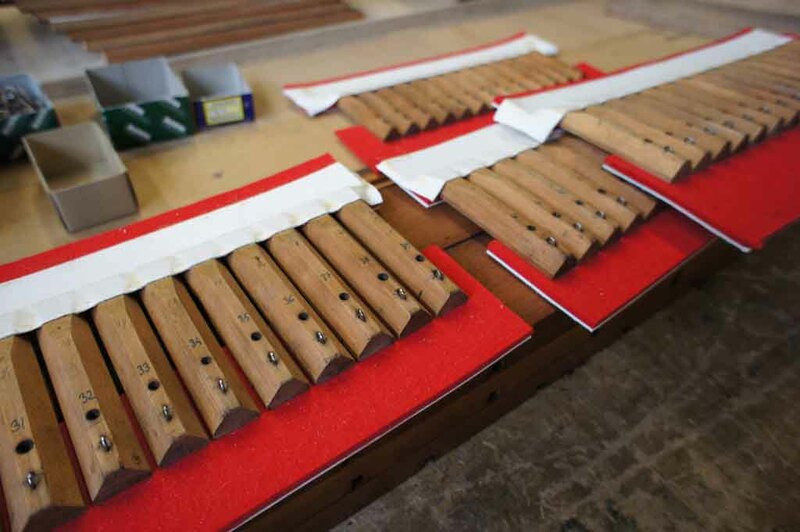 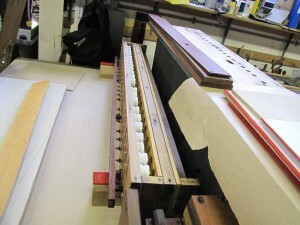 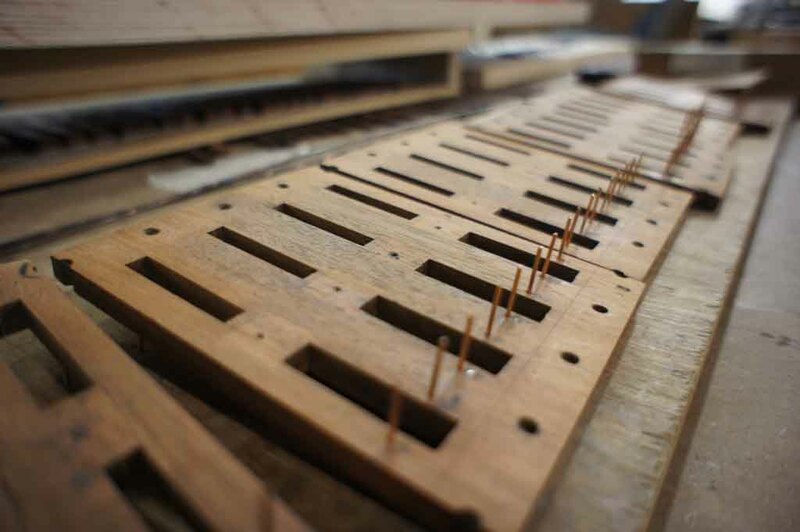 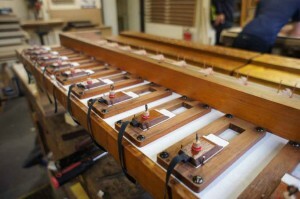 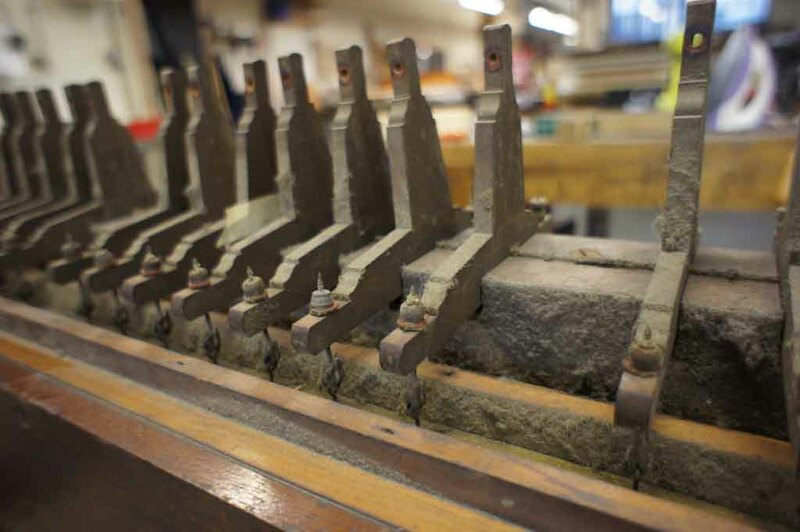 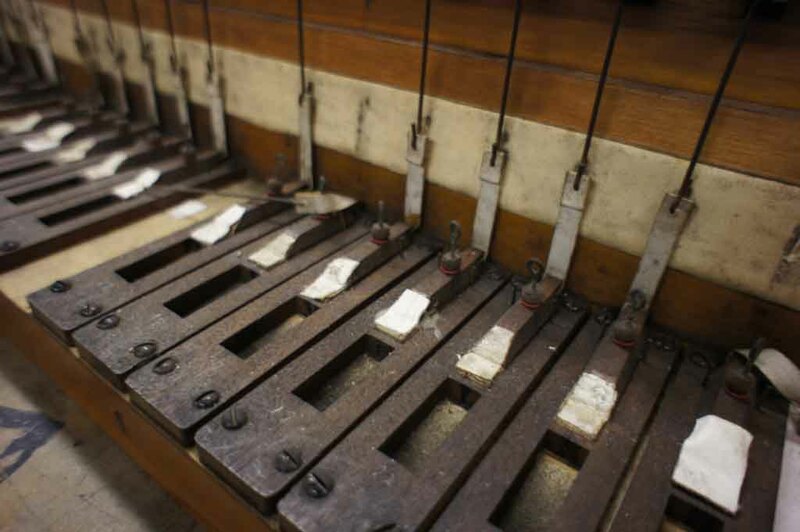 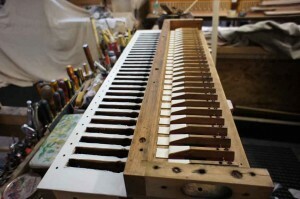 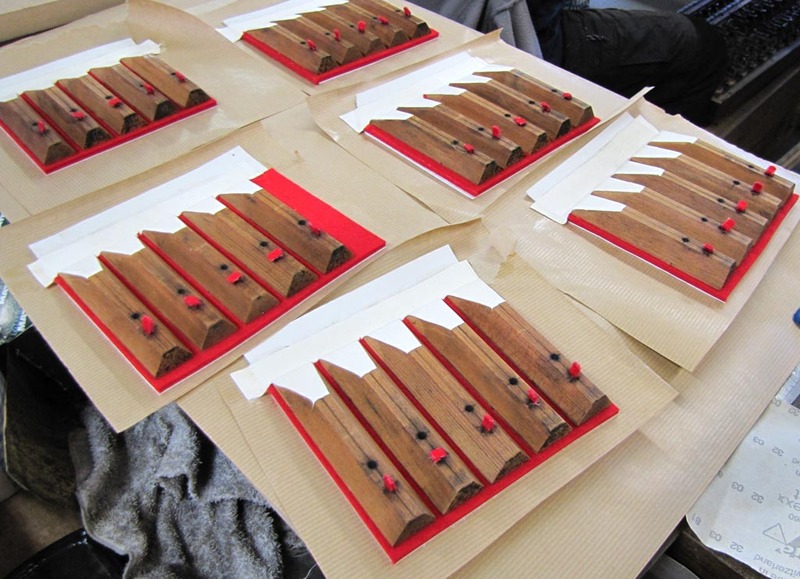 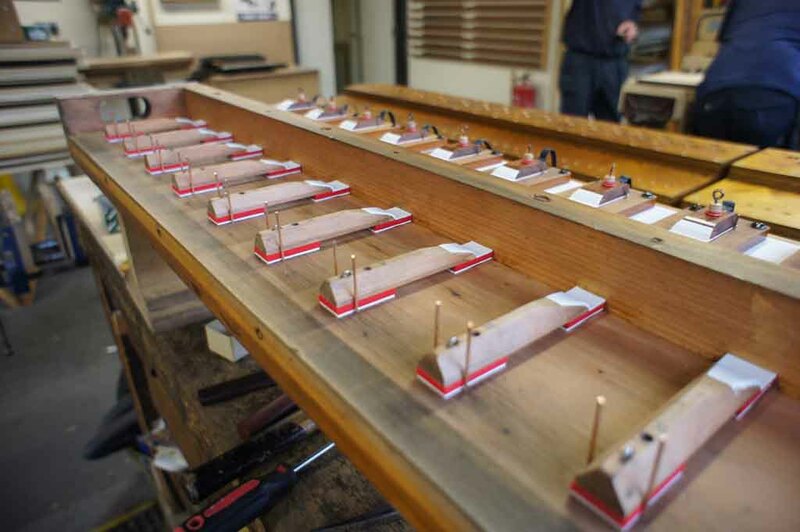 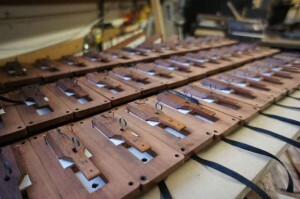 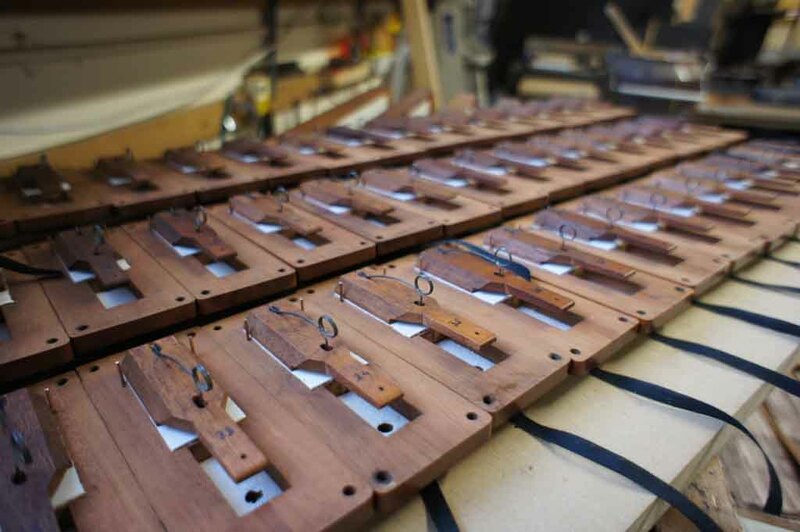 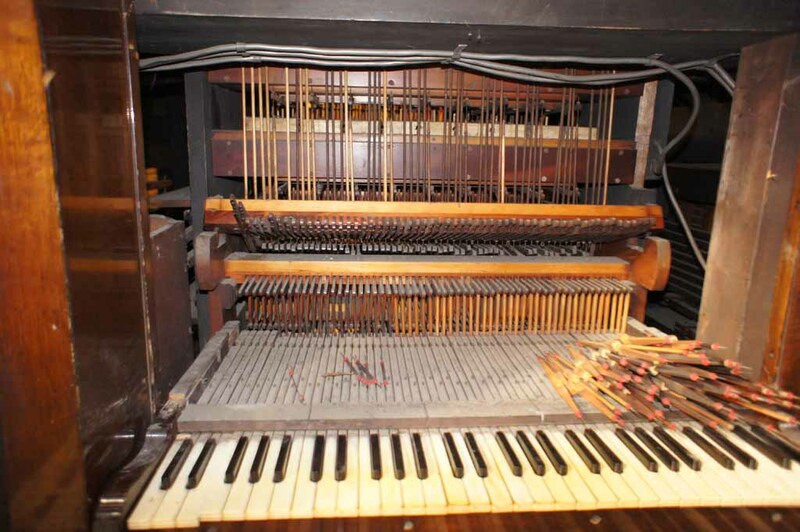 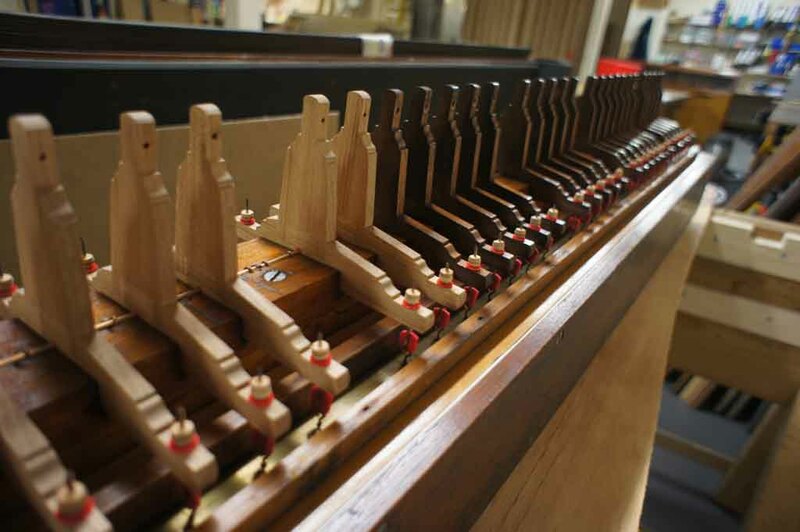 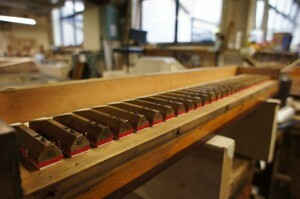 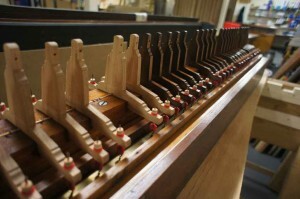 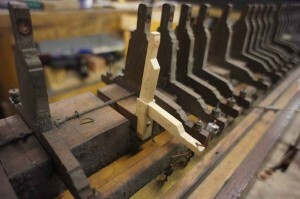 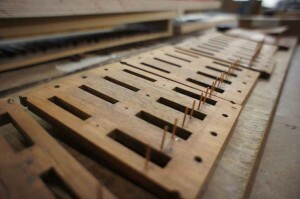 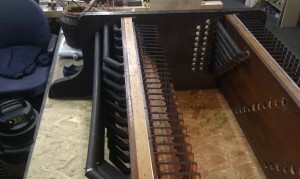 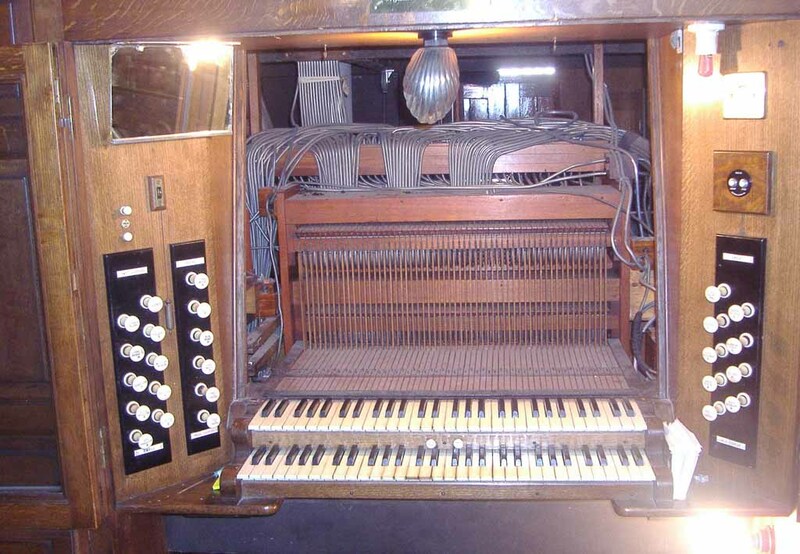 T-squares were in a bad state of repair, some having been replaced to keep the organ playable. 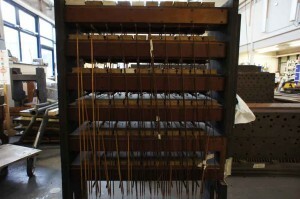 Barker Lever Machine before restoration. 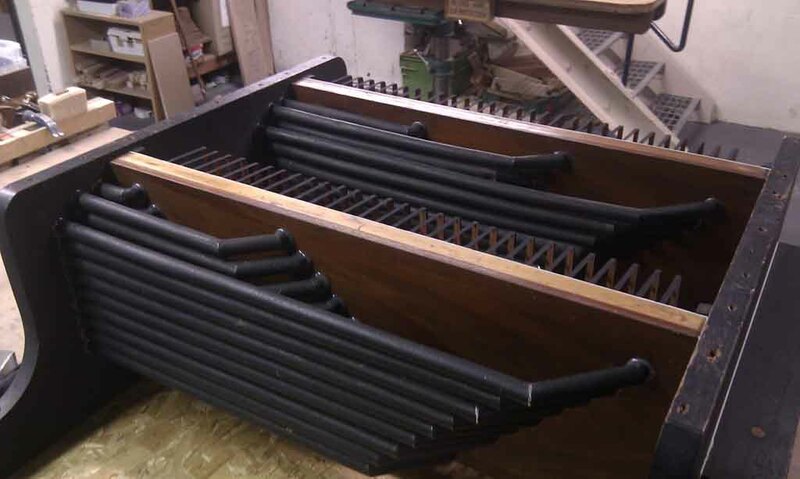 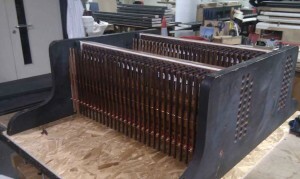 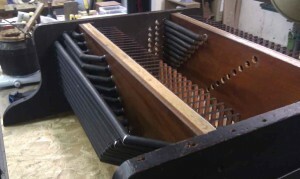 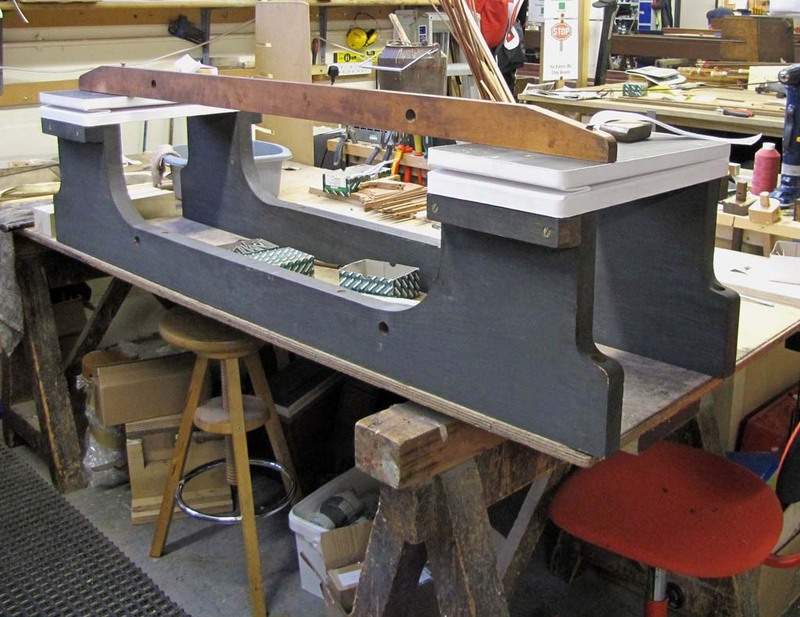 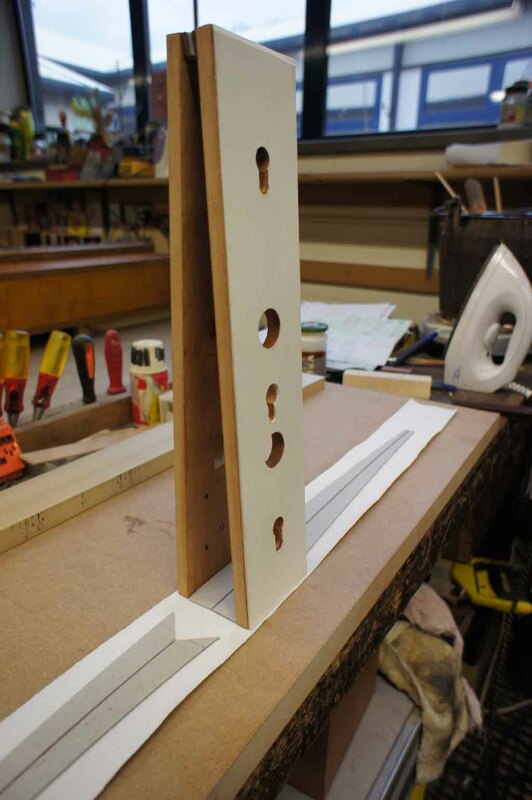 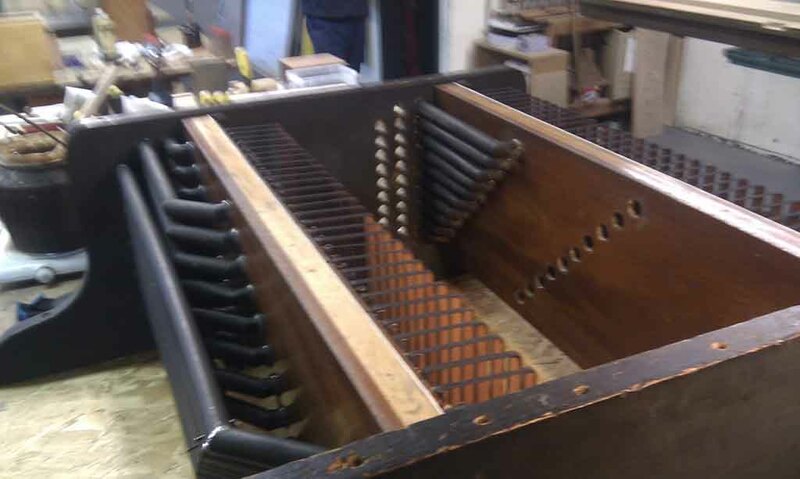 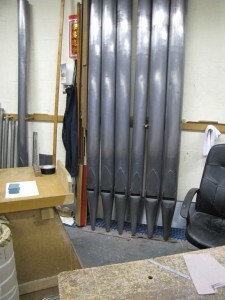 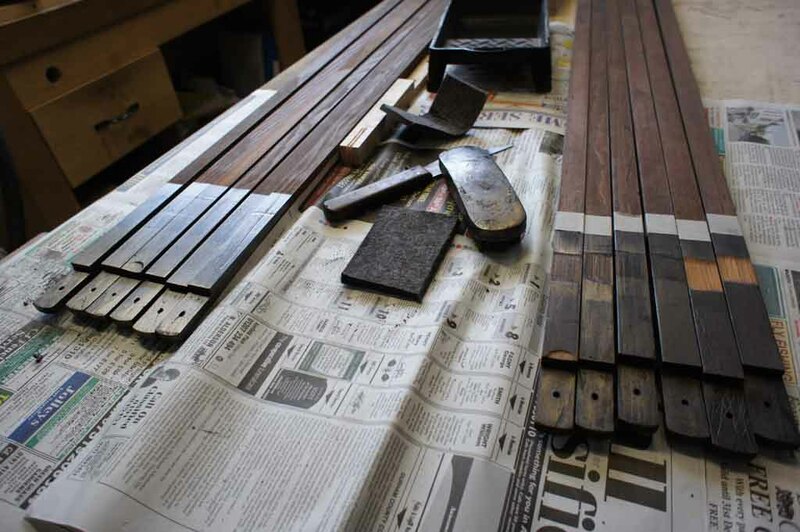 Ribbed motors of the Barker Lever machine and Swell action being releathered with new ribs also. 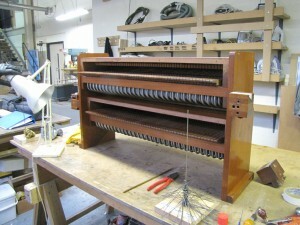 Barker Lever Machine after restoration. 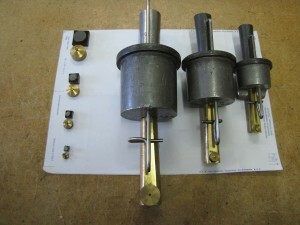 Some of the couplex valve mechanism releathered and nearing completion. There are six layers of these valve mechanisms. 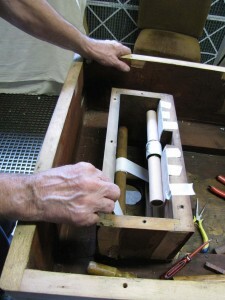 Swell touch box: showing the restored valve and lever mechanism back together. 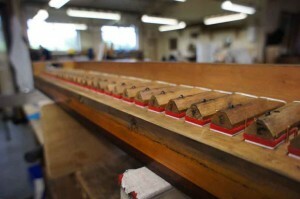 Some of the action conveyancing is being re-glued in place. 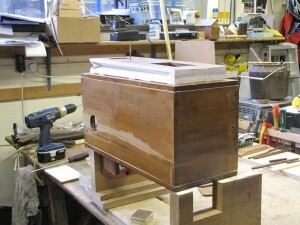 Swell touch box intact and restored. 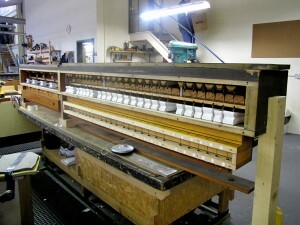 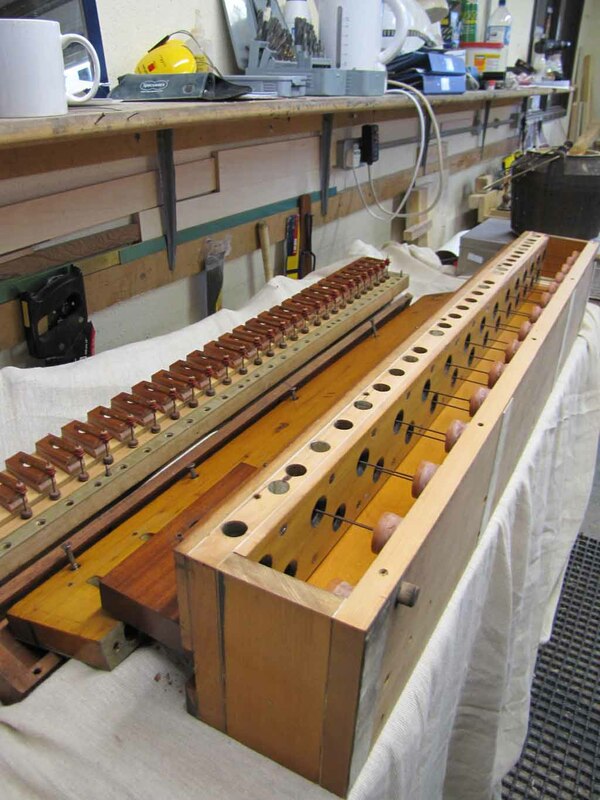 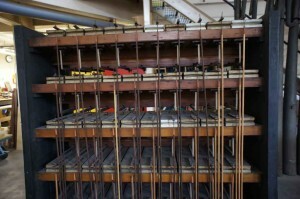 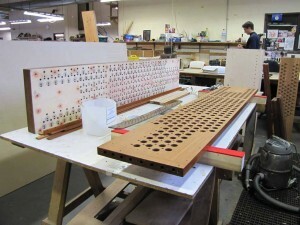 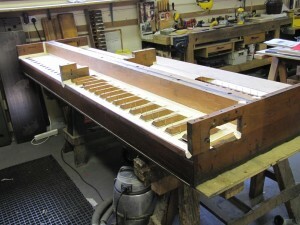 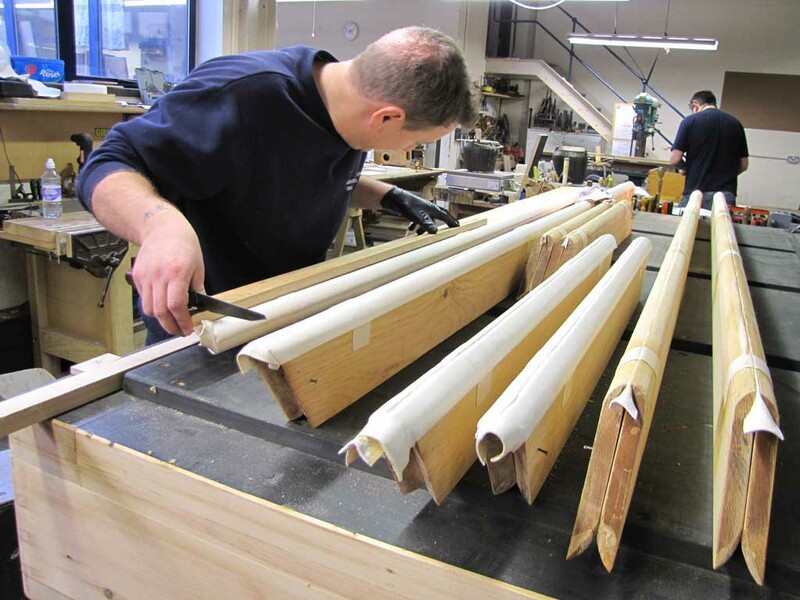 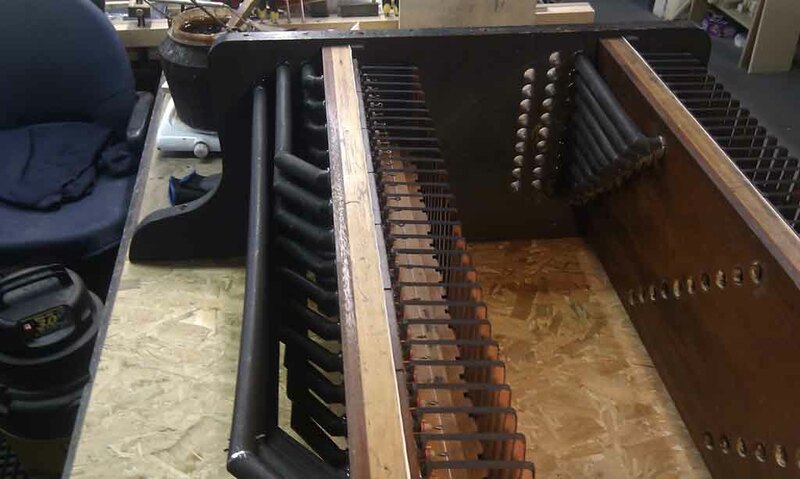 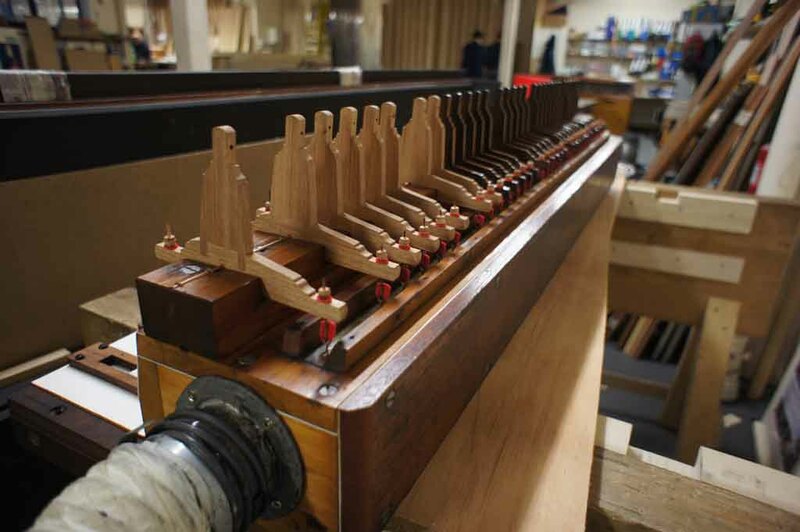 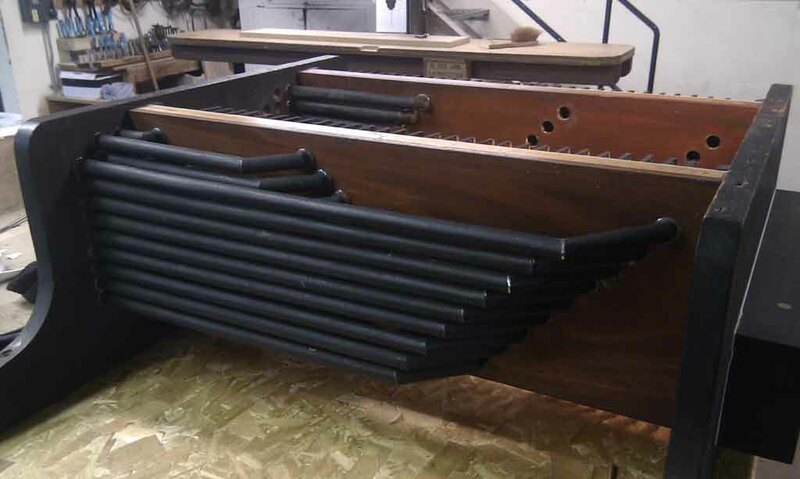 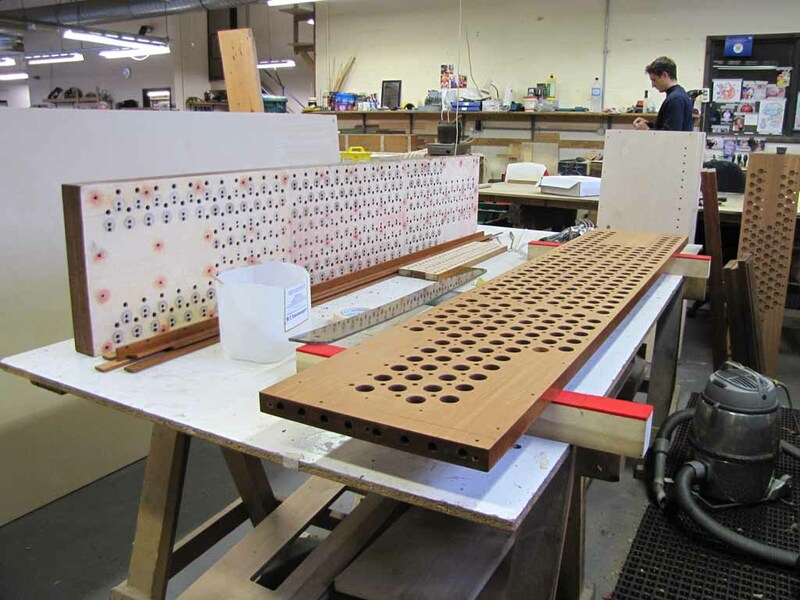 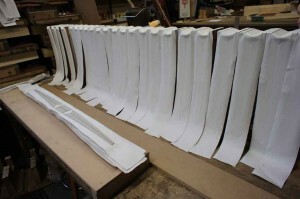 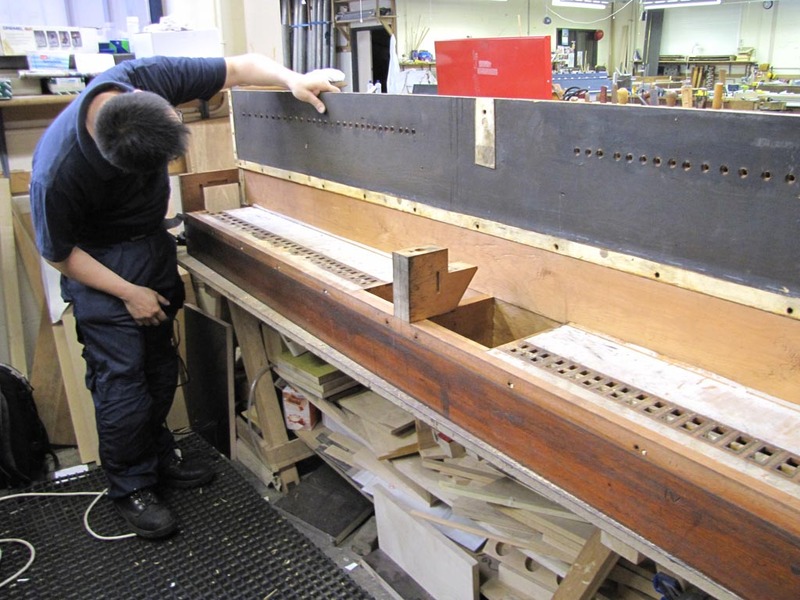 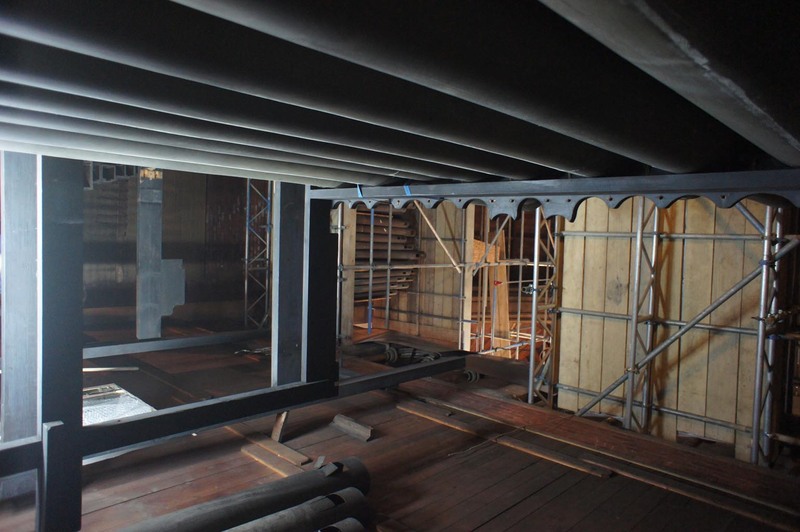 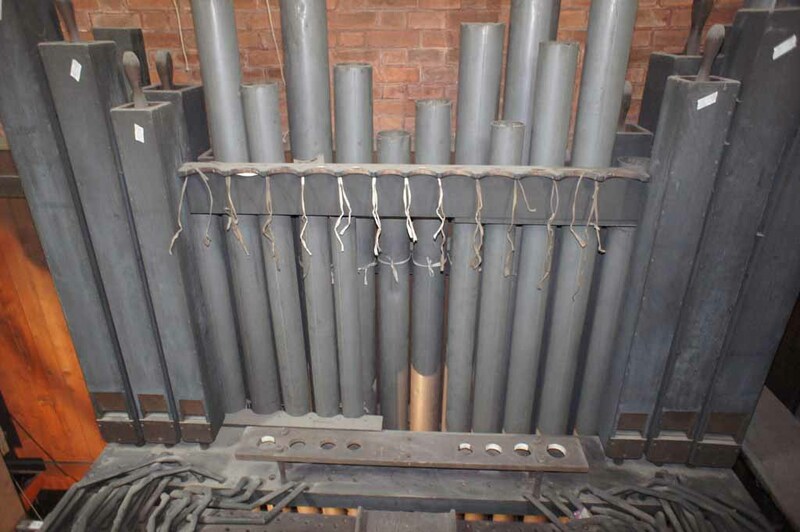 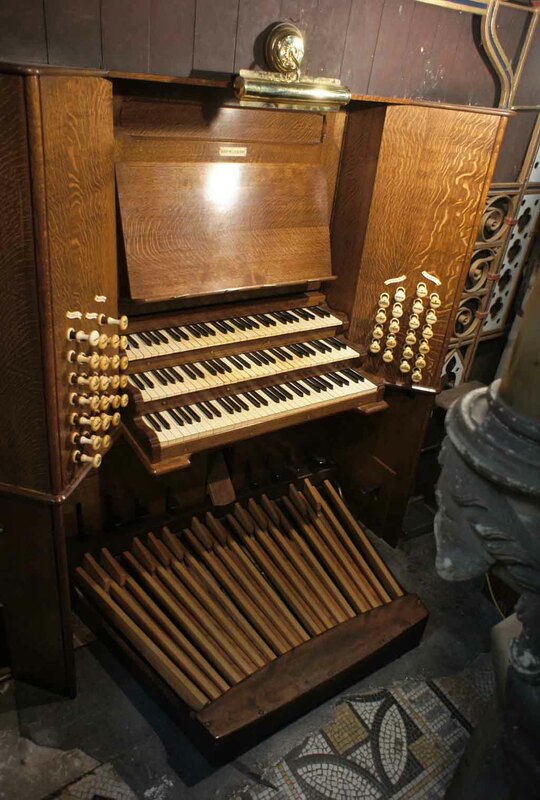 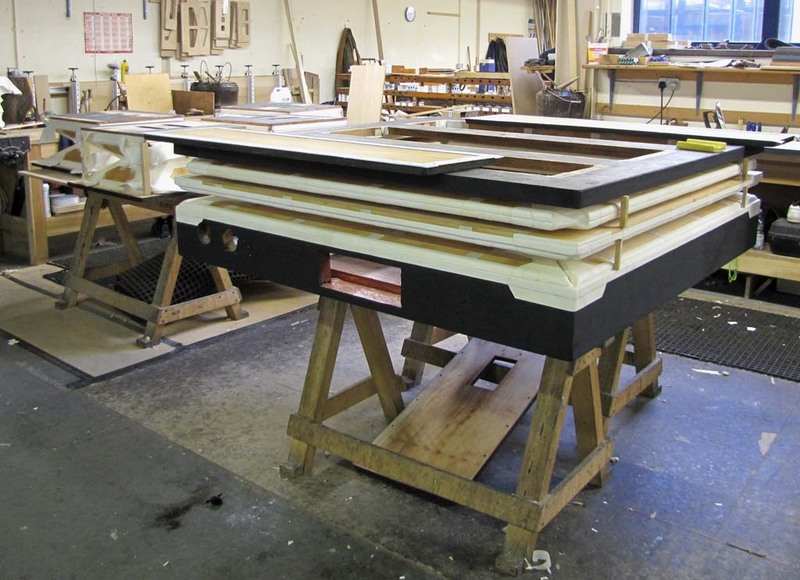 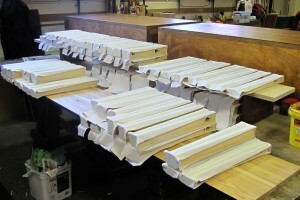 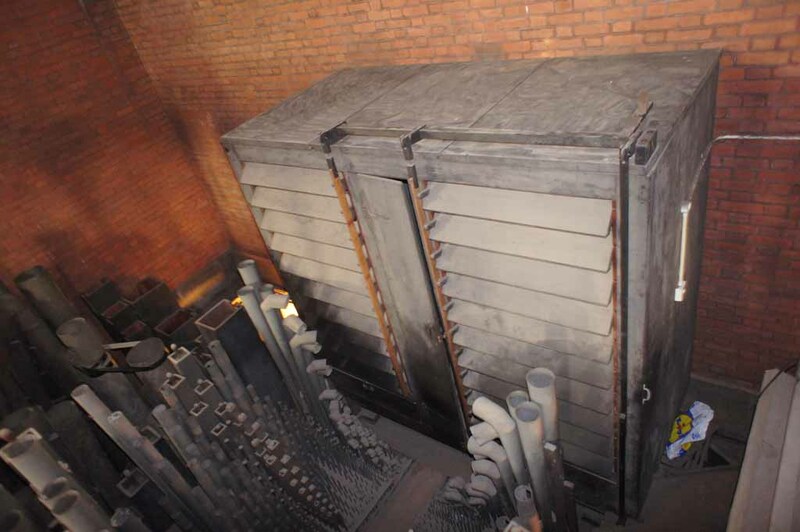 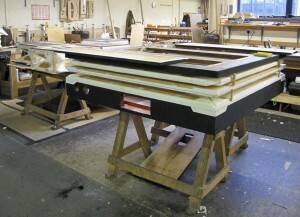 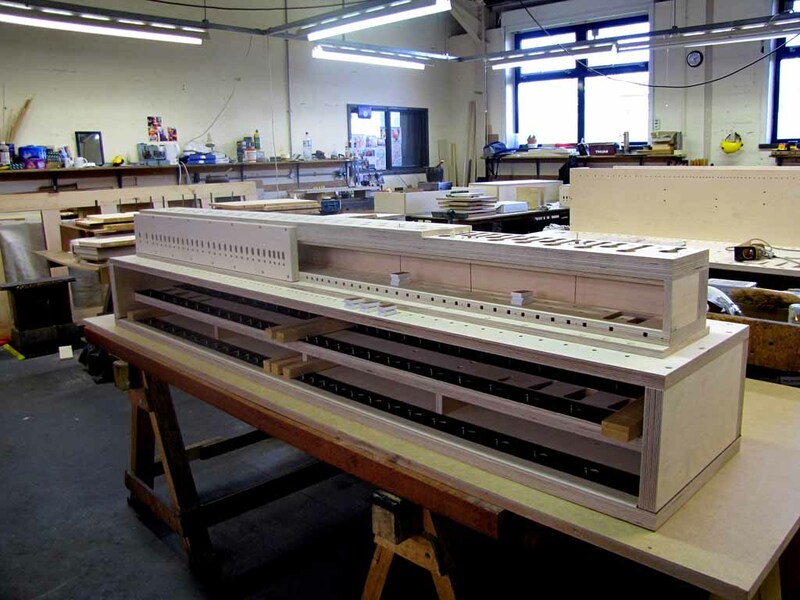 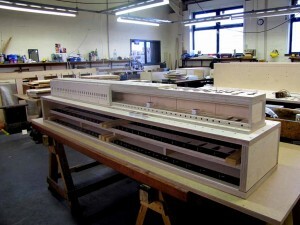 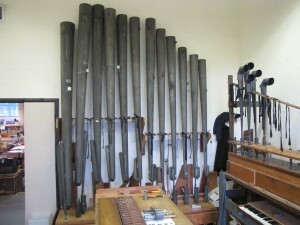 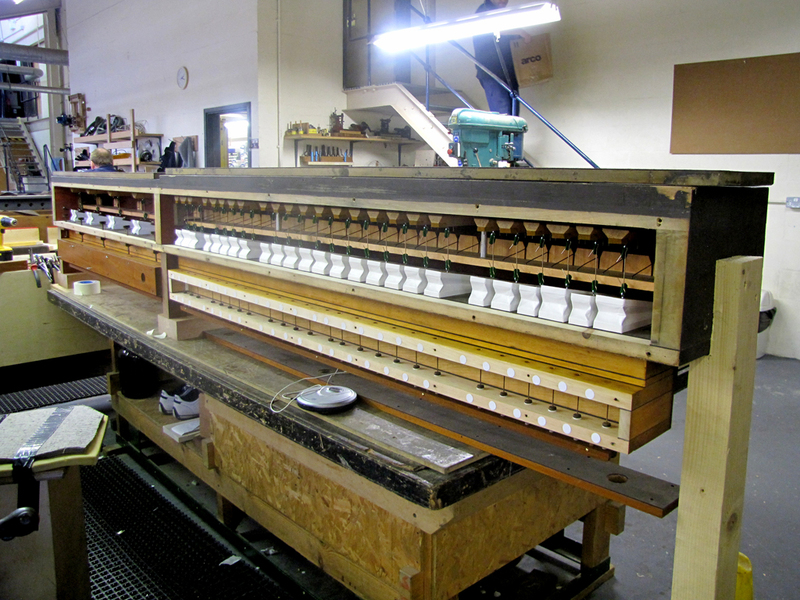 This shows only some of the conveyance in the organ, of which there are over 500 pieces. 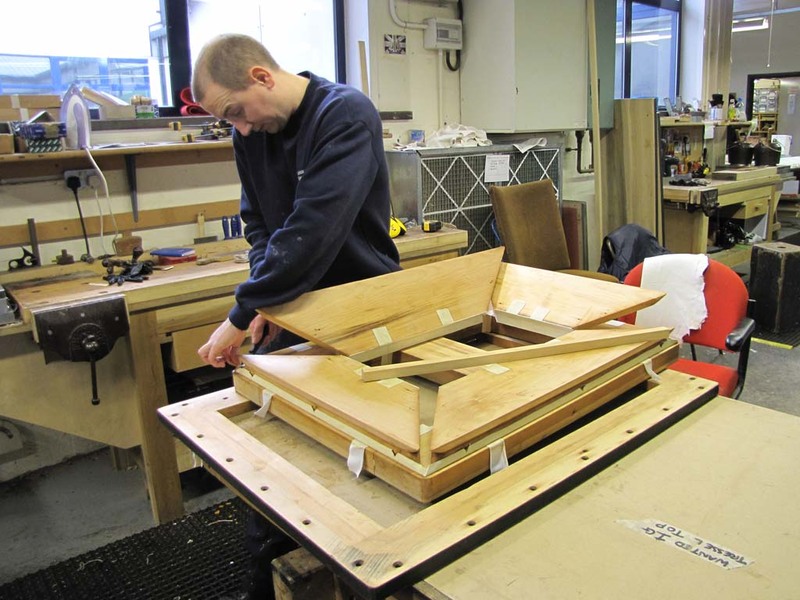 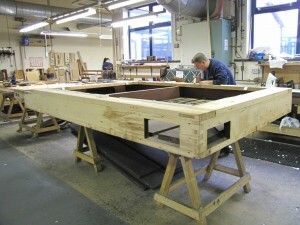 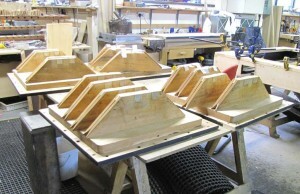 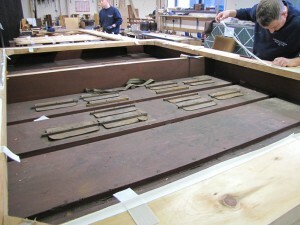 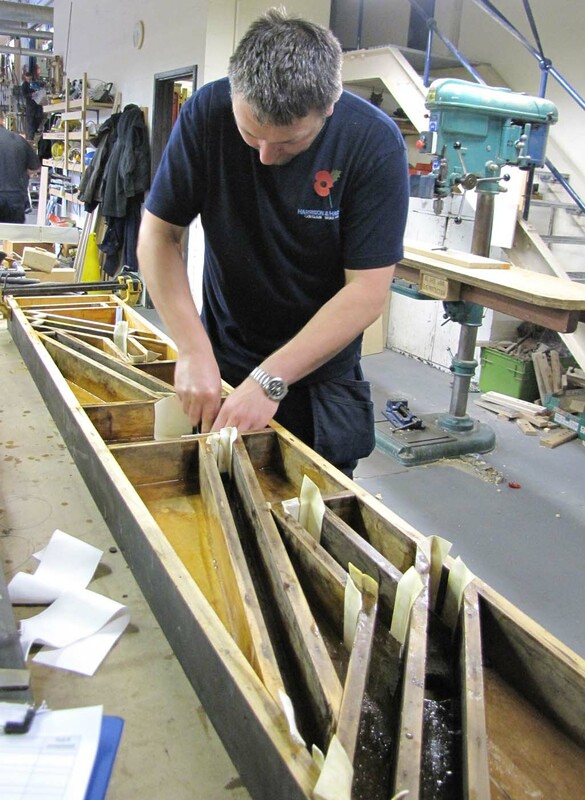 Pallets in the Swell mechanism being re-fitted. 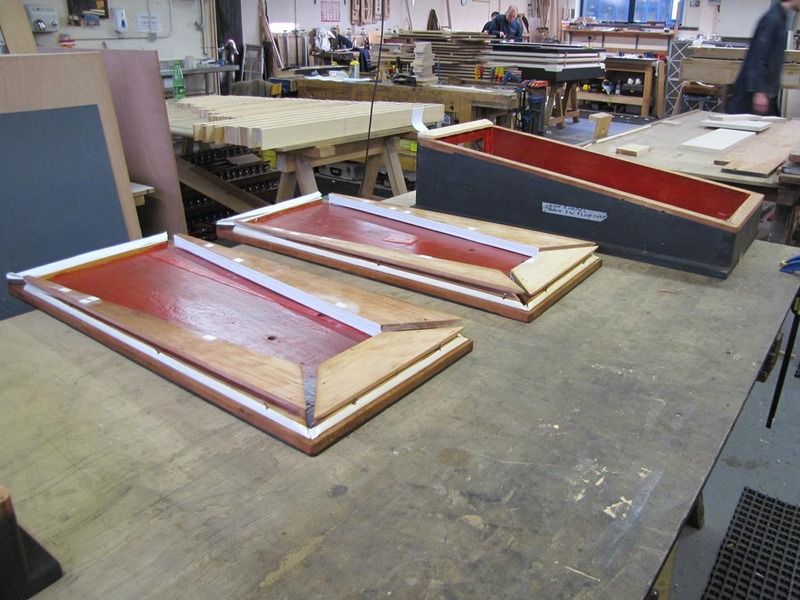 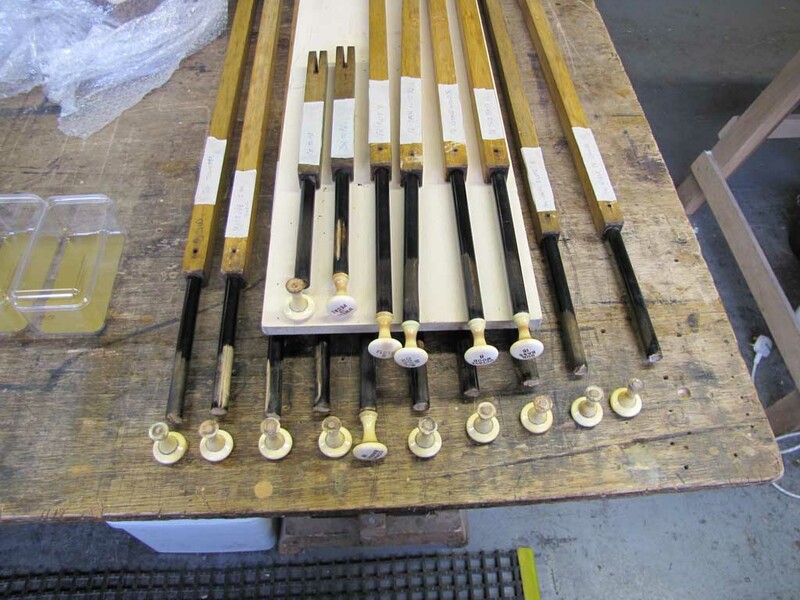 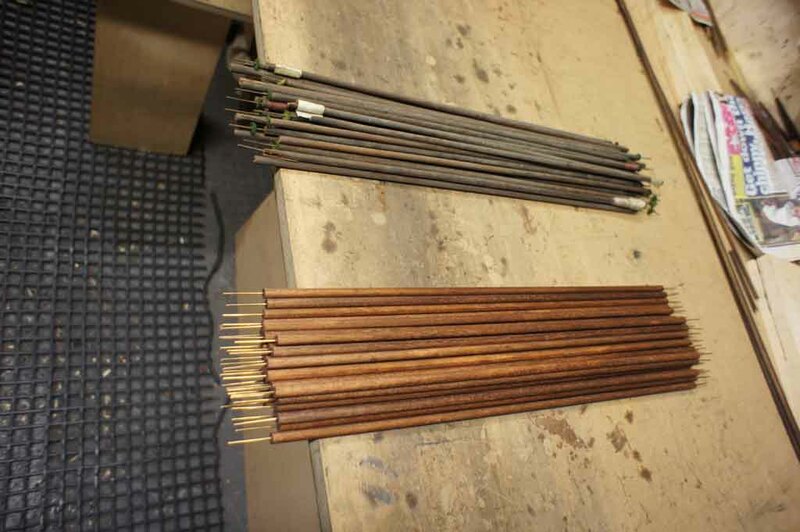 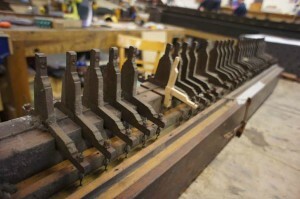 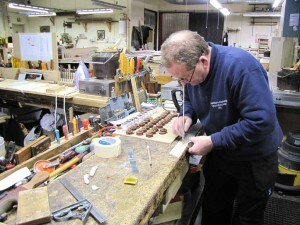 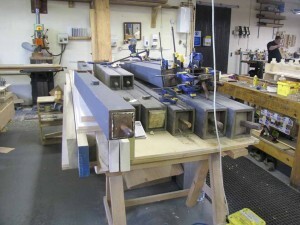 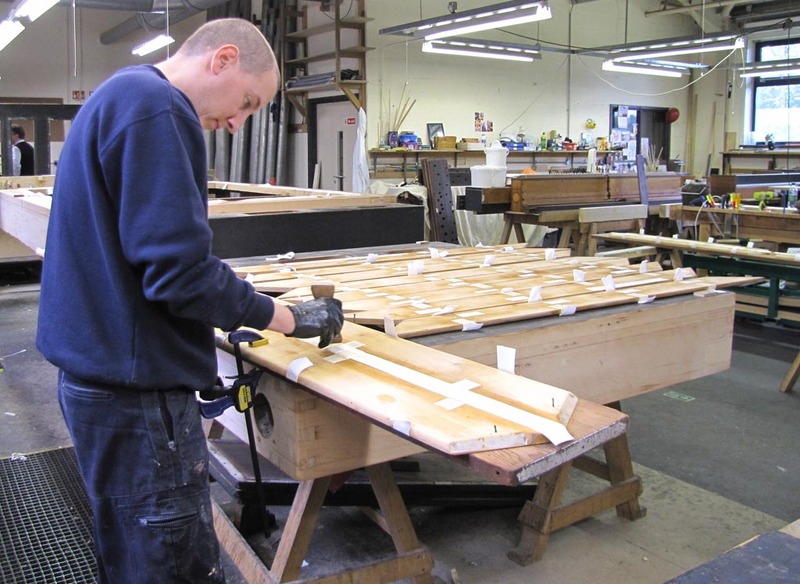 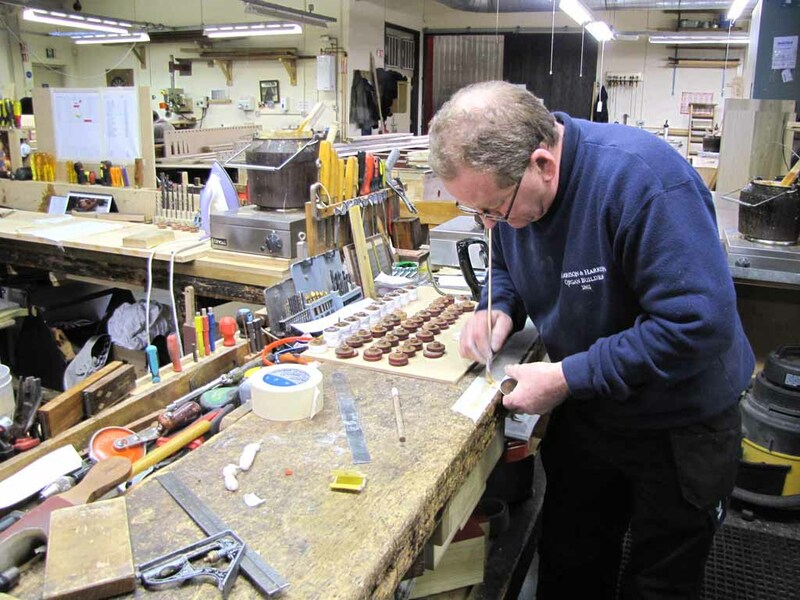 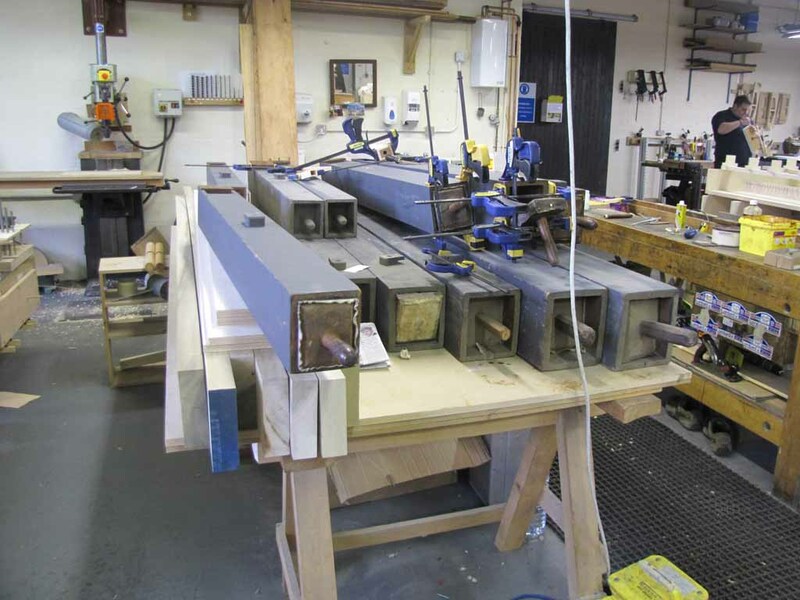 ‘Black Lead’ on some of the stop action rods being renewed to ensure smooth running. 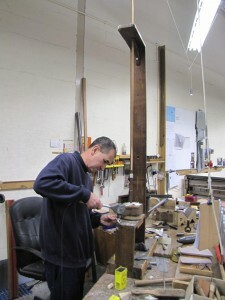 Overhaul and releathering of actions.